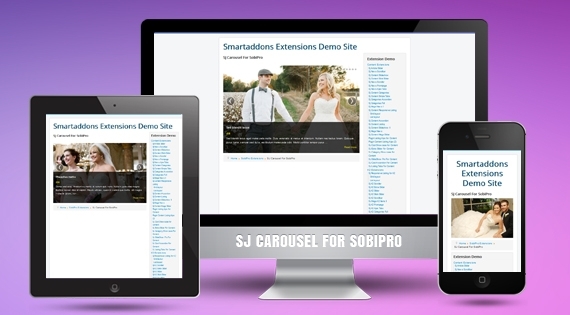 SJ Carousel for SobiPro - new module for displaying multiple images and/or other contents within a single area on a website in an effective and simple way. This module is inherited previous features of SJ Carousel for Zoo which mainly focuses on responsive layout and powerful library support to show the best representative products of website. At first sight, you will see one-and-only frame of large images attached with impressive title and brief description of items, supported by smooth sliding effect. So the rest thing you need to do is to pick up information you like by hovering and clicking into chosen items, then the whole picture and detailed information following it will turn up as usual. Moreover, it's built with responsive layout trend for any device such as Laptop, Tablet, Mobile and many other options can be configured easily in admin panel. You can also add Item Price which is suitable for selling-product website and makes it different from the previously mentioned module, or Tags, Social Buttons, Related Articles and Readmore button in each slide to be more friendly with audiences. This module is not only used for news websites, but also for any other kinds in general using SobiPro component. Open a new chance by yourself with us to express and deliver your idea to the world perfectly. Now, let's access this module's demo to have the best overview!